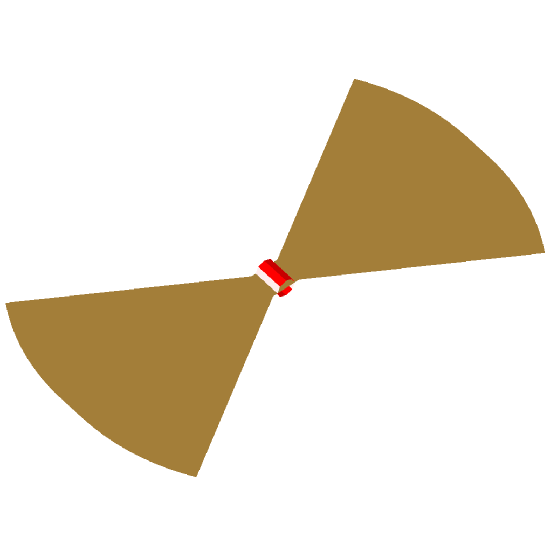 Image of the Rounded Bow-tie. Modified dipole shapes are often used to obtain wide-band operation without increasing the complexity of the antenna. The rounded bow-tie antenna represents a fairly simple dipole variation, and provides good wide-band performance in spite of its simplicity. This antenna is popular for frequencies ranging from UHF up to the millimetre wave range, and has also found application in arrays. The rounded bow-tie is closely related to the conventional (triangular) bow-tie; the rounding results in an impedance frequency response that is flatter than that of the regular bow-tie. For transient applications (i.e. when short duration pulses are used), bow-tie antennas with rounded edges demonstrate better performance as reflections from the ends occur at the same time instant. Pulse radiation can be further improved by resistive loading [Shlager et al.]. The rounded bow-tie antenna performance is not sensitive to small parameter variations, improving robustness to manufacturing tolerances. While the rounded bow-tie antenna provides fair wide-band performance, this is not a high performance antenna; demanding applications may call for more complex designs.